Tewksbury Lodge offers the unique experience of accommodation in an authentic, traditionally handcrafted Canadian style log cabin. The Lodge offers, Self Catering Accommodation with all the features and facilities you expect from accredited, 4 1/2 star accommodation, including superior furnishings, log fire and spa. Recline in your leather lounge suite inside, or sit back and relax outside in comfy chairs on the spacious verandah, with a private BBQ, overlooking secluded gardens. Stroll over to the swing seat and your own fire-pit above the Ovens river, with beautiful views to Mt Buffalo's gorge. 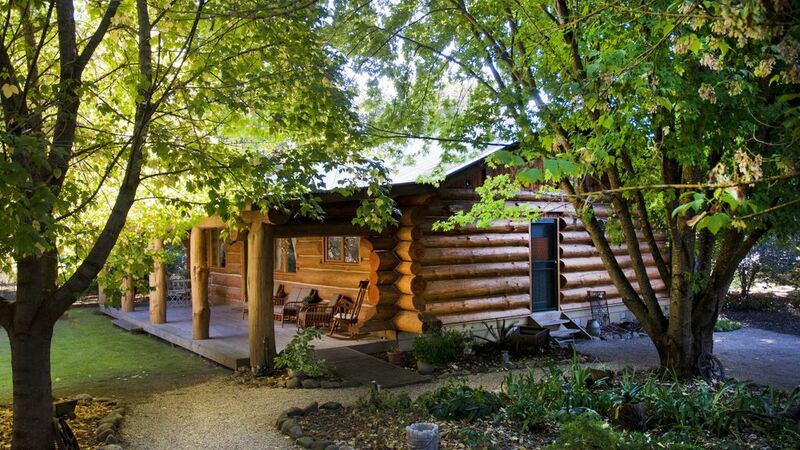 3x winner, "Best Hosted Accommodation" - Alpine Business & Tourism Awards. Tewksbury Lodge is an Eco Friendly dwelling and we pride ourselves on being environmentally responsible. - The Lodge is a superb insulator. A conventional house has an insulation value varying from R2 to R4. This log cabin has an insulation value of R16. The very high insulation capacity reduces heating and cooling requirements. - Large logs have another wonderful property - their thermal mass; they are capable of storing heat. When the cabin temperature is lowered (e.g., at night) they give back heat into the rooms until the temperature is again equalized. Large HD TV in Lounge, small HD TV's in both bedrooms, with DVD players. Selection of family / kids DVD's. His & Hers hybrid bicycles provided free of charge. Toboggans provided free of charge. It was great staying in the lodge. Outside was 33 degrees but inside it was very comfortable and cool. Every detail was thought of and owners were friendly and did not intervene. The property is very clean and outside was maintained and wonderful with access to river it was amazing visit. We are so glad you enjoyed your stay Irena. Thank you for leaving the Lodge so neat and tidy too. We really appreciate it and would love to welcome you back one day. KInd regards, Claudia & Paul. We decided not to stay at the property after arriving and spending an hour looking around. There were a number of reasons we decided to leave. The weather during our stay was oppressively hot and the cabin was as a result really uncomfortable. There was an airconditioner in the living room that reduced the temperature by a few degrees in there but all the fans in the bedrooms did was push hot air around. It was really uncomfortable inside. Outside there was some kind of really unpleasant smell, I'm not sure if it was coming from the river or a rotting compost pile in the garden. Either way the smell made sitting outside on the balcony or in the garden very unappealing. The smell made me feel nauseous. The bed linen was not what I'd expect from a property with such good reviews, perhaps we were just unlucky on this occasion but the king bed had small black/grey stains on the sheets and small rips and holes in the fitted sheet. Most of all we were disappointed to find that the cabin is located in the back garden of the owners property. The advertisement of the property describes the cabin as being situated on 2 acres of picturesque gardens. While it may be on 2 acres, the problem is the 2 acres is shared by the cabin and the owner's house. A pertinent detail which is left out of the description. We are quite private people and felt the description was deceptive. We would never have booked the property had we known it was on the same site as the owner's home and sharing the "2 acres of picturesque garden." Details like this really need to be disclosed to potential clients. It is unfortunate your expectations were not met. The day you arrived was 34 degrees which is a fairly typical Australian Summers day. Humidity was high over much of Australia though, due to a cyclone in W.A. which possibly made it feel worse for you. We do open the Log Cabin up to air during each change over, but the cabin has incredible insulation characteristics and effortlessly handles temperature extremes. With A/C and the doors and double glazed windows closed, it could have been any temperature you desired inside within hours. We are unsure of the cause of a smell outside. There was a fly trap some 20 meters away. Possibly the breeze carried a smell. If it had been brought to our attention, we would have investigated this. All linen was only recently replaced, so something is amiss there. It does sound like an error was made. If so, we do apologise. The Lodge is on many web sites and is listed as ‘Hosted Accommodation’. On Stayz, our listing stated we are winners of awards in the " Hosted Accommodation" category and multiple Stayz reviews refer to ‘the Hosts’. I assure you it has never been our intent to deceive. We have made updates to further clarify this, in the hope of preventing a misunderstanding like yours. We thoroughly enjoyed our stay at Tewksbury Lodge, Porepunkah. Our Log Cabin was absolutely beautiful, both in its surroundings and its pristine cleanliness. The beds were beautifully made and super comfy and everything we needed was there. We hope to go back soon. We'll definitely recommend Tewksbury Lodge to our friends and family!! Everything was just perfect. THANKS!